Imagine a plant that survives sub zero temperatures, mountain slopes or hot dry summers for months on end. Imagine a plant that produces roots only in cold weather and cleverly appears to die off after it flowers and disappears underground. These survivors are the bulbs of spring! Bulbs are tough and hardy plants that have evolved as underground storage units which grow, flower and increase in size year after year. Watching bulbs emerge is always a surprise and a cheery beginning to spring. Follow these simple guidelines and learn about planning a garden with spring bulbs. What do I plant? This is your opportunity to plant what you’ve always wanted and this is your very first step! Because most bulbs need a sunny location and soil that doesn’t stay wet, identify areas of your garden that would be suitable. This may be a new bed that you have targeted strictly for bulbs, or areas of existing plantings. Most bulbs need to be planted 3 times the height of the bulb, but refer to any packaging for specific details. Plant in groups! Single rows or one here or there isn’t going to have impact. Planting in high numbers is always more effective, especially with colour! Alternatively, bulbs can be planted in natural looking drifts that curve around existing shrubs, trees, statuary or even in the lawn. Throwing bulbs down and planting where they fall is another idea that is easy and gives a natural effect. 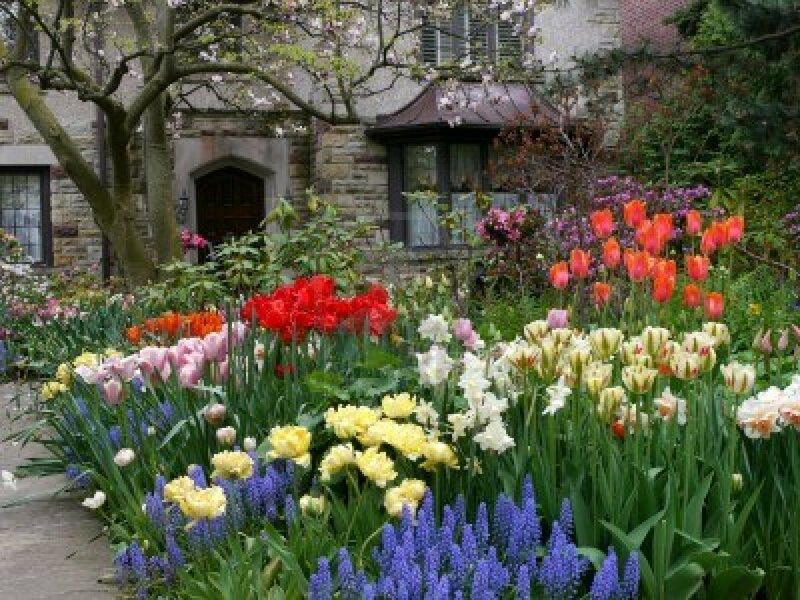 Small bulbs are most effective in groups of 25, while larger Tulips, Narcissi or Allium in groups of 7, 9 or 12. Remember to note the different potential heights of bulbs and plan accordingly. Planting for colour! Do you have a shrub with colourful foliage or shrub that flowers early? Use this as an opportunity to plant for contrast and impact. Do you have a yellow flowering Forsythia or an evergreen Choisya with yellow foliage? Try blue and purple bulbs as companions. Another approach is to use a single colour throughout the garden. Try a pair of colours, pink and yellow, or orange and purple. It’s possible to enjoy colour for up to 10 weeks or more. To be successful, choose a few bulbs from the early, mid and late flowering periods. This is indicated on packaging. In Landscaping, a design technique that uses repetition with colour and form are the most effective. When admiring a particular planting, you will see this technique used. Connecting different areas with colour and form allows the eye to travel throughout a given space. 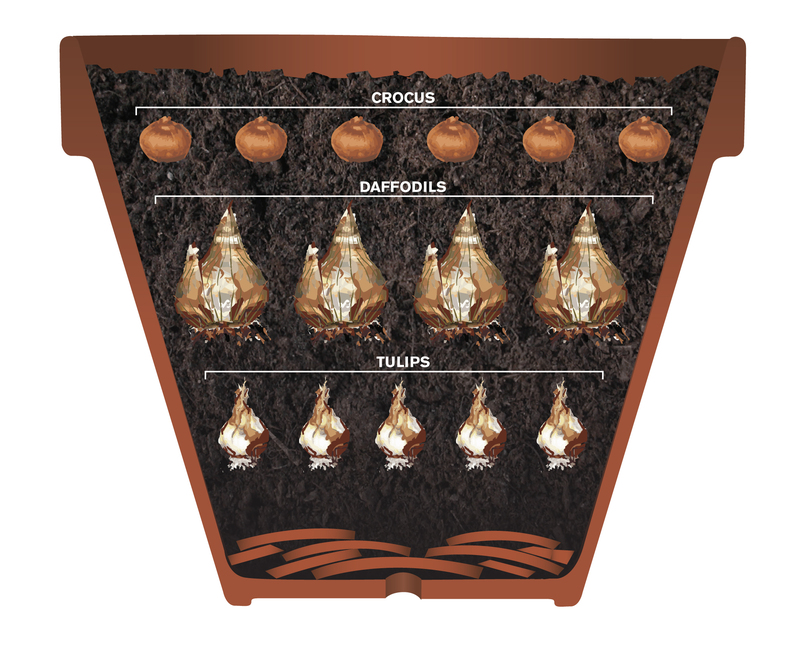 Bulbs can be layered, because they are planted at different depths. Smaller bulbs like Snowdrops, Crocus or Mini Narcissi emerge first as they are planted near the surface. Mid and late season bulbs are deeper and can continue the flowering period for a steady stream of colour. Try the smaller bulbs with Narcissi, Tulips and Hyacinth. This technique is very effective in planters as they can viewed up close. Visit our online store at www.wildwood.express to shop our full selection of fall bulbs.